Thanks but i really wanted a 4x4 and haven't enough time to do a 4x4 convertion. I really want a 12ft mini box truck. I'm putting out feelers to see what my van is worth as is vs finishing the 4WD completely, which I will if it's worth it. It's a 2000 Ford E350 7.3L with 360k miles and a UJOR 4" kit with 33's. 4.10 front axle, the rear has a 3.55 that needs to be re-geared. Trans needs converted to 4WD (I have the tail shaft and housing and T case). And axles for 4WD. As is, what do y'all think it's worth? Not looking to make a profit or huge gain here, just wanna buy the box truck I'm looking at. Not sure on value as is. I’d say finish it and you’ll get a bit more $$. There are always lots of half finished projects for sale that “just need a few things.” You always wonder why they aren’t finished if it’s so easy. Spring is coming, and with that vanlife dreams start happening, and prices go up. Finish it and sell in a couple months. That’s really my plan. Just finish up 4wd. And then it’s worth selling. Just not put a locker in it. No question about finishing the 4x4 conversion before selling it. 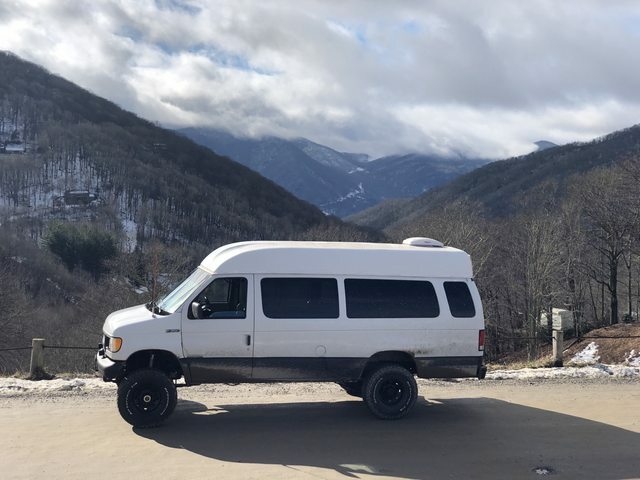 I love your van, but 360k miles will be a tough sell, specially for people that just want to jump into the Van life. It is really hard to price these things. Most people rebuild the transmission for the 4x4 conversion. I like the way it looks and I know the 7.3s pretty well but I haven't had one with that many miles. I have seen them with 700,000. Did you get it like it is or did you complete the work yourself? You have to figure out your cost to finish versus what you will make for the effort. If it will cost you $5000 to finish it but your only add $3000 in value then it isn't worth. The problem is people are going to assume the worst, because it is partially done. Finished or not the mileage is your biggest hurdle. People will nit pick over the mileage so you have to figure out what it is really worth in the end. A lot of people have big dreams and empty pockets. I only say that because you have to find someone with cash that doesn't care about the mileage. If memory serves me correctly the green van below went for between $20-$25 and it was a 7.3. It was listed at a bad time. If you can get yours ready now is a good time to sell. PM me we may be able to come to agreeable terms. 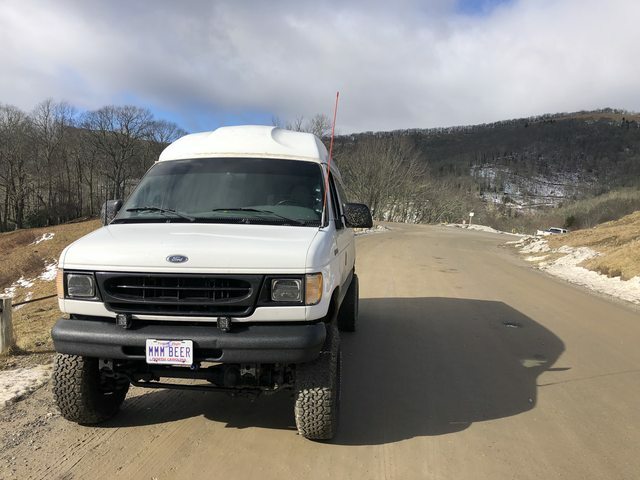 I have a 2001 F450 6-speed 7.3 4x4 12' Box truck with I believe 8' Ceilings and a side door. (rare bird, I have never seen another like it) The wheels are on my ambulance now. I planned to ask $10-$12,000 but haven't listed it anywhere but here. Let me say first, that I love my van and I think it's bad a**, BUT... the only thing I would replace it with is that small SRW box van. 1. Gas. Sure having a diesel van is cool, but it's not cheap to maintain. Plus, you can't climb hills like you think you could. You have to watch out for EGT's. And gas engines are quieter. 2. The height. A square 12' tall box is better. And not being wide, can still park, and go anywhere my van now can go. 3. The large rear bumper. I can build a super rack on the rear bumper that would crush anything I could do with my van. 4. Still 4WD capable and can be just as fun. I will finish up the 4WD kit when I get off the boat in 2 weeks. I'm looking for a walk through box truck, but thanks for the offer on the F-250. Honestly, once I have everything buttoned up, IF I sell, my ideal price is $15k. No more, no less. I'm not trying to get $25 for a van, even if it's 4x4. People overprice these vans too much. I understand that mine is rare because it's a 7.3L, but I'm not trying to rob anyone. I just want enough to buy the other box van I'm looking at. If I can't get the $15k, then I'll keep my van. I have absolutely no problem with that at all. I'm a boat captain and you have to have a basic diesel certification to drive the boats at the scale I do. It may have $360k miles, but it's mechanically perfect. I have done a LOT of preventive maintenance, and upkeep to make sure she can go anywhere. And the right modifications, like a wicked wheel 2 turbo impeller, EPBV valve delete, new glow plug relay, new water pump / thermostat / fan clutch. Plus a 4" turbo back exhaust with SCT tuner. She hauls the mail. A good running 7.3 won't have any issues climbing the same hill when compared to a gas truck with the same load. If you tell me what it is doing I may be able to help you figure it out. I know guys with 7.3 pulling car trailers uprated to 40,000 across the country. One of my LMTV was delivered by a 7.3. Consider making a post in the regular section. I have a ton of 7.3s. They are cheap to maintain but problems are often misdiagnosed. Stumps has a stock injector rebuild service for under $600, that will wake the truck up. I think right now, the issue is 3.55 gears with 33" tires. That's gonna change soon. If I keep the van, injectors are very high on the list. 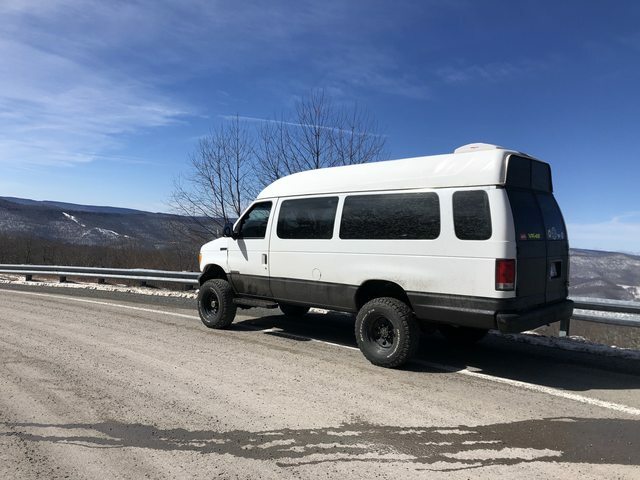 Van for sale on advrider.com. My van is also for sale; it's time to work on the next version. 12 Passenger Van, Rear Wheel Drive. 345000 Miles. All service performed at a local Chevrolet dealer per maintenance schedule. Dome lights converted to LED bulbs. Lund aluminum running boards, wheel well to wheel well. Auto Ventshade hood deflector and side window deflectors. Reflectix insulation added beneath subfloor, behind side panels, in rear and side doors, above rear 1/3 of headliner. Removable Reflectix coverings for side windows and windshield. 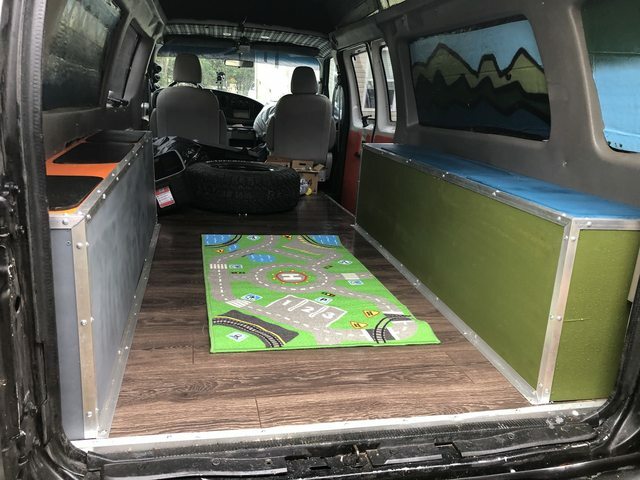 ¾ inch plywood sub floor, full length from rear door to right behind the front seats, surface treated with multiple coats of Minwax semigloss polyurethane coating. All-weather carpeting over the open subfloor from rear door to front engine cover. 2 x 2 framed cabinetry with ½ inch plywood facings. ¾ plywood doors on cabinets, magnetic latches. Anti-slip liner for the bottom of all cabinets. Storage console with open shelves and enclosed space, also holds solar controller and house battery/inverter. Accessory wiring from house battery to a custom panel behind driver’s seat; voltmeter, 12 volt and USB power points, used for phone charging and powering a portable fridge/freezer. Renogy RNG-100D 100-watt monocrystalline solar panel, installed into a PVC frame for portability/remote setup. Side storage pouches above bed and storage console. Battery operated LED task lights x 3; one at side entry and one above each side storage pouch. Hinged-lid cabinet with anchor points behind driver’s seat; platform for the portable fridge/freezer, designed around our Dometic CFX-65 12-volt fridge. Hinged door on front. Molle-type accessory rack secured to back of passenger seat; fire extinguisher mount and customizable mounting configuration. Spacer and storage assembly inside sliding passenger door; hand-held radio and flashlight storage, also provides mounting point for removable chuck box. Custom chuck box; hinged lid with platform for camp stove, dual front hinged doors double as work surface, open interior storage configuration. Fully functional in-place or removable for use on picnic table/alternate site, also accessible from inside the van when secured in place. Smittybilt gutter-mount basket brackets, used as mounting point for 2 crossbars to attach side awning. Yakima windshield fairing on front bar. ARB 2500 softcase awing, attachable ARB Deluxe Awning Room with floor. Only for sale at this price before it is shipped to the East Coast.